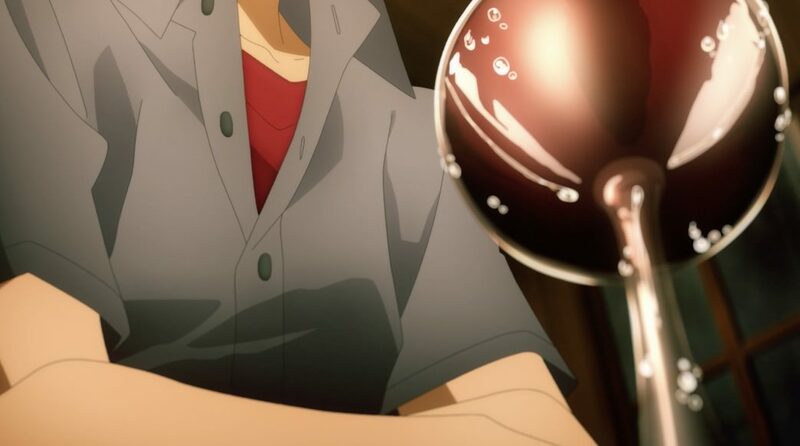 I opened up the season with a show that I never really had high hopes for given, well, basically everything I knew about it, but I was surprised to find that Between the Sea and Sky (or, SoraUmi) actually had quite the finish opener! 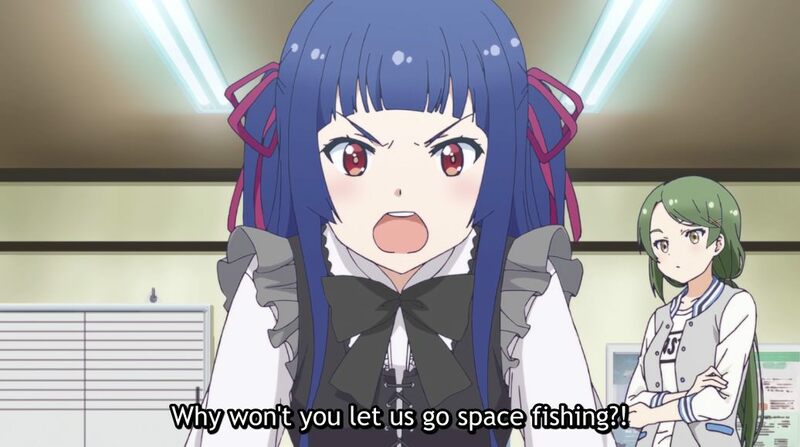 The premise of “girls go to space to catch fish” was one that caught my eye immediately when I was perusing the upcoming anime charts ahead of the season’s start, and it’s nice to see that – despite the heavy use of CGI for all the mechanical elements, which was an expected disappointment – there’s just a bit of zaniness in the show proper to match the concept. 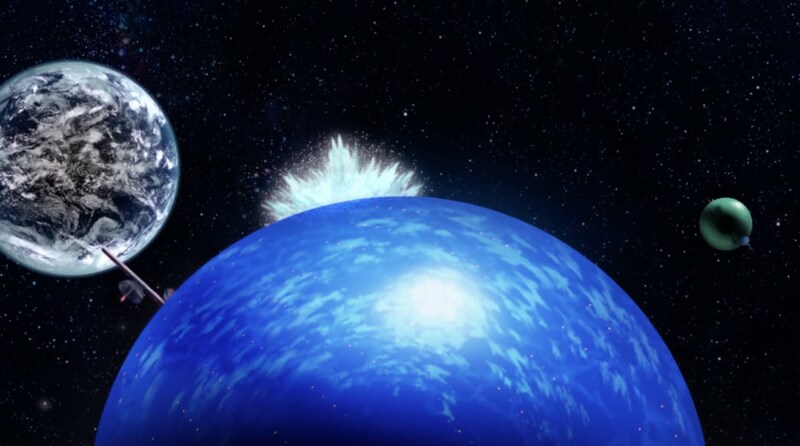 And, I must say, it’s to SoraUmi‘s credit that it gets the one thing most important for an anime set in space right: it shows space in all its grandeur. The sense of bigness you get from space anime that take time to show space in all its glory is something that I deeply love out of many mecha anime, and although SoraUmi doesn’t spend an inordinate amount of time showing space, it does enough. That combined with an archetypal but energetic cast (perhaps I’ve been away long enough from mediocre anime to find casts like this charming again!) made for a premiere I thoroughly enjoyed. SPACE FISHING! Let me tell you a story. A long time ago, back when a young anime fan version of me first watched the first Sword Art Online, I went looking for more, captivated as I was by the show. And so, I found my way to a fan translation of the Alicization arc of the story, which impressed on me a striking sense of austerity in storytelling (which I later came to realize was a result of the understandable but not altogether professional-grade translation). Later, when Yen Press began to publish the Alicization novels in English, I picked them back up, and found myself swept into a fondness for SAO that I thought had evaporated in the waves of criticism it receives. Yes, joy can be sapped from even the most stubborn of hearts by constant negativity. In any case, we now find ourselves with the inevitable anime adaptation of Alicization, and if one thing stands out to me with this premiere, it’s that it presents more or less exactly the same experience as the books – nothing more, and nothing less. 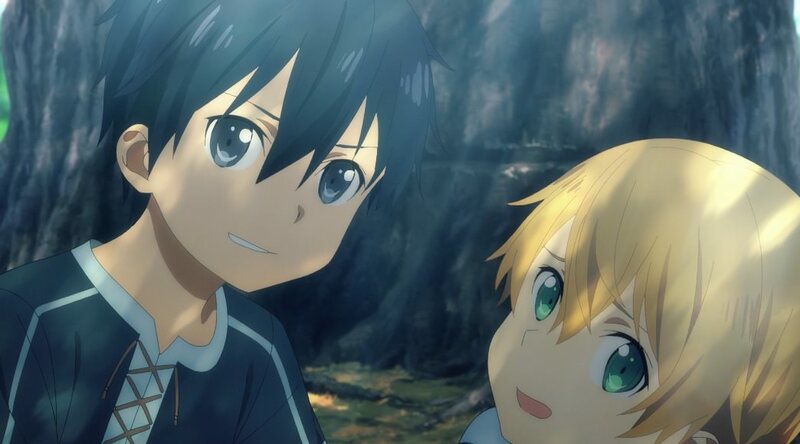 That is to say, the core appeals of Alicization (the bonds between Kirio, Eugeo, and Alice; getting to see the old cast members) are conveyed well. In a word, it’s workmanlike. From a more critical perspective, one might even say it lacks vision. Critically, the visual aesthetic’s shift from the cartoony look of the first two seasons to the more “”””””refined”””””” (bleh) look from Ordinal Scale is a major downgrade, and the world feels much more sterile that the SAO we used to know as a result. But, you know, Kirito and Eugeo have a secret handshake in the OP – and isn’t that what Alicization is really all about? Fair play. Studio Trigger has finally made a good anime. After all they’ve wrought, they’ve finally come up with some good. An anime with that puts to good use so many of the group’s best tendencies – characterful environs, their fondness for other works (in this case, toku/kaiju stuff), distinctive and cute character designs – and wrapped all up in a bundle of quirky character-building and a clearly genuine love for the franchise to which this anime is paying homage. I mean, an insert song plays when the robot powers up! In the first episode! Yes, director Akira Amemiya’s love letter to the show of his childhood is overflowing with love and care in this premiere, and the result is delightful. 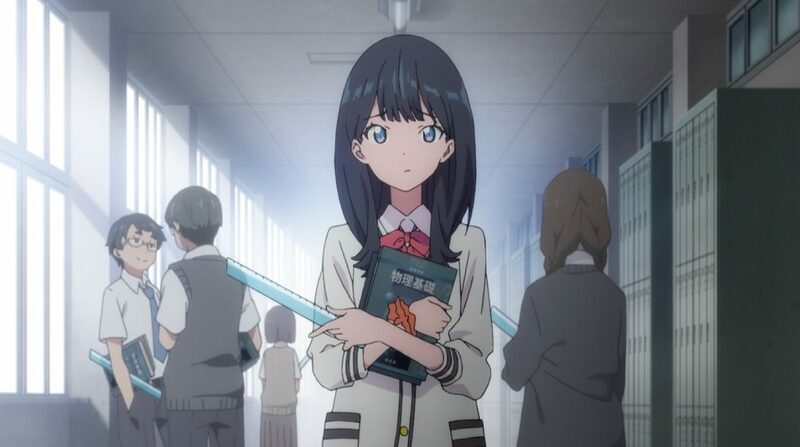 All that said, I think the thing that stands out most for me in SSSS.Gridman is its delightful grasp of tone. Anime is no stranger to using amnesia as a storytelling device, but Yuta’s fumbling through what’s supposedly his life throughout the episode, as well as his weird visions no one else sees, feels genuinely unsettled – although, appropriately, it avoids feelings actively creepy or the like. The use of diegetic noise throughout the episode makes the entire runtime (especially in places like the school hallways or classroom) feel tangible and immersive. 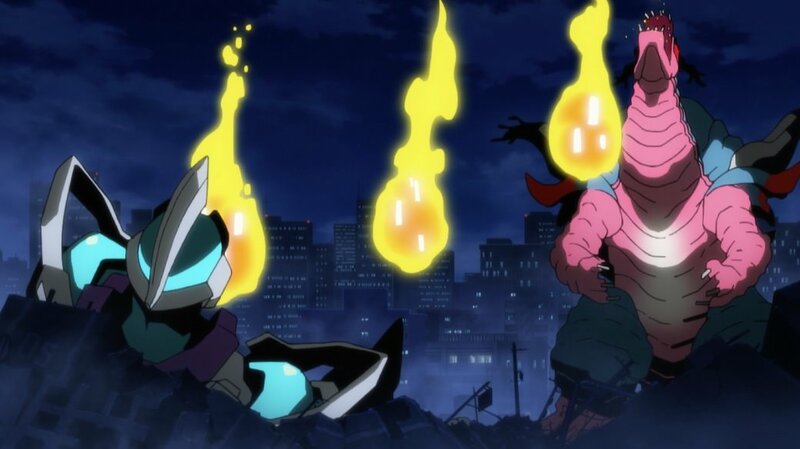 The main characters thus far, with their relationships outside of those with each other, further this feelings, which means by the time the show kicks into high gear with Gridman battling a kaiju, we’re already firmly settled into the world. Glorious. Give me more. Oh, the content of this premiere? Well, it’s pretty standard stuff for the genre and everything plays out about how you would expect. One thought that did occur to me is that an unintentional merit of the iterative nature of the “girl starts club of moderately novel activity” moe story is that many different kinds of activities get highlighted almost by requirement – and thus also end up being treated seriously. For me, I’ve always seen cheerleading as something of a frivolous activity (although I did have good friends who were cheerleaders), but the seriousness with which Anime Yell regards the sport demands the audience take it seriously as well, at least if they’re going to invest in the characters. And that’s actually kind of neat. Now here’s a premiere that blew by, pun fully intended. Run with the Wind‘s premiere is actually quite clever, in that it starts with something a tad bit odd and then, about two-thirds of the way through, hits you with the actual hook – and by that point, just like the rest of the dudes in the Kansai University Track Club dorms, it’s far too late. The episode’s already over and there’s no escaping the fact that you’re engrossed and can’t wait to see how Haiji’s incredible gambit to dupe 10 dudes at once into running with him pans out. But the incredible reveal aside, the pace (pun fully intended) at which the premiere of Run with the Wind goes by really is impressive. These kinds of introductory episodes that spend time speeding through their cast – and this is a big one, too – are familiar in both construction and their frequent drudgery, but Run with the Wind succeeds on this front because introducing you to their relationships and their shared, lived experiences in the dorm as much as it is to the characters themselves. And this means that, even if there are archetypes present, their characters are revealed as much by the way they interact with each other as by whatever their defining quirk is. Kudos to this premiere. It’s a very, very good one. A boy finds a cute girl in a bottle his dad got him while adventuring. They proceed to bicker and be cute together. Yes, that is both the main story and the main appeal point of Merc StoriA, which is not a point against it. After all, it is very good at what it sets out to do. That said, having such modest goals and achieving them so competently – I mean, you can see the image of Merc, the titular girl in a bottle, below for yourself – leaves me with relatively little to talk about. But hey, it was more interesting that Radiant! I suppose, though, that the one reflection I’m able to offer up is that I think I’ve come to the point in my anime watching where only being cute and offering little else in the way of compelling characters or stories (let alone more sophisticated things like atmosphere or exceptional visuals) isn’t enough to keep me watching long term. Yes, Merc StoriA is very cute and the relationship between Merc (delightfully voiced by Inori Minase) and Yuu reminds of the relationship between Danmachi‘s Hestia (also voiced by Minase, as it were) and Bell, but where you’ve got other shows that can manage both being cute AND doing something else, cuteness on its own is a tough sell. Anyways, after I got through the very funny opening joke and the actual creepy zombie horror stuff that I could stomach and turned off, Zombie Land Saga began to click along quite nicely for me. Frankly, I’m a bit unsure of whether the meta-joke (“idols, but they’re zombies”) is strong enough to hold up an entire season without more of a story to drive it, but for a premiere it least it does a solid job of making you feel for the heroine who, other than being a zombie, fits well into the role of idol anime protagonist. There’s also a nice sense of pragmatic edge to Sakura and her decision to just make the best of the confusing and kind of horrible new life she finds herself in, which is something that a show this bonkers can use. In any case, it’ll be interesting to see where we go from here, but I’m sticking around at least for the rap in episode 2! Okay, so riddle me this: Supposedly anime fans like cute girls, right? So, it would stand to reason that a fantasy anime about a cute girl who gets reincarnated as a slime with a cute voice and that (later) turns into another cute girl (or at least nicely androgynous human shape) would be popular, right? Then why, for the love of all that is good, must we suffer through a gosh darn 37-year-old, completely uninteresting salaryman being the one this story is about? Argh! I can’t believe it! In any case, I haven’t tried out this many premieres in quite a while. In terms of what I plan to stick with… Alicization, Gridman, and Run with the Wind have each made a strong enough case that they’ll probably last the season (and beyond). Outside of those three, it might be a dog fight between Merc StoriA and Anima Yell for my dose of cute this season, and I do, surprising even myself, have some interest in continuing Tensura. So, we’ll see! The top tier is good and there are some fun auxiliary pieces to work with to create a satisfying schedule. Here’s hoping we all have a good one! How about you guys? What premieres have you liked and what are you thinking about staying with this season? The one show not on your list that I really liked was Rascal Does Not Dream of Bunny Girl Senpai. Yeah, it looks sketchy, but it’s really good. Top tier banter, and it looks like a strong romance. 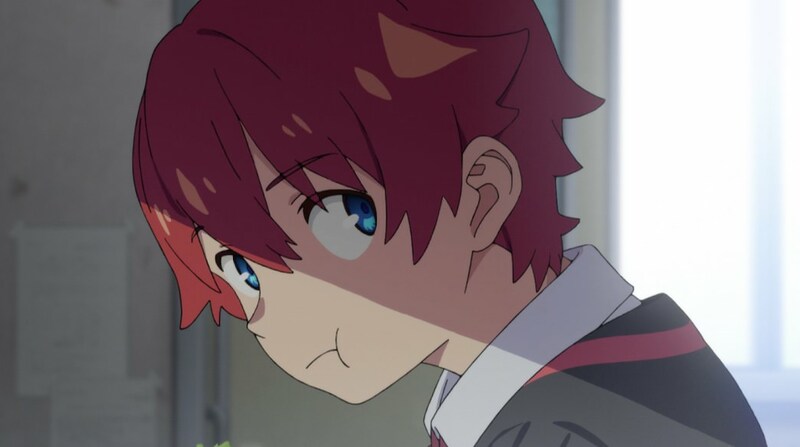 Otherwise, I liked Gridman and Zombieland Saga. I do wish that HiDive got their iOS app back up. I haven’t seen any of the shows that have yet. I’m with Rverghes here, with saying that I wholeheartedly recommend Rascal- The summary and what I thought was a shallow premise turned me off, but now that I’m eagerly awaiting the next episode; take whatever expectations the cover gave you and throw it away. Just jumping into the first episode will tell you if you’ll love it or not. Great characters, and very interesting conflicts. The show’s being doted on for having excellent banter between characters, which I absolutely love! Anima Yell! There’s not much that somebody doesn’t take seriously… I mean look about the room and what are we doing? Still, if it sticks with that approach this could be good. What, are you saying the general populace doesn’t take anime blogging seriously!? BTW, the 2nd ep is pretty good. When I randomly decided to check in, I didn’t expect to find a premiere review, yet here it is. I rolled my eyes at the opening joke of Zombieland Saga. Somewhere in animeland there is garage where they store homicidal trucks until they need them. But then the deathmetal opening came on, stopping the animation every few seconds, and I thought maybe the show does know what it’s doing. Episode 1 didn’t fully sell me on the show, but episode 2 removed all doubts. Best ED of the season! Merc StoriA is incredibly cute. I also like the monster designs. If there’s one line spoken in the show that sums it up, it’s: “What’s important is that Mr. Fluffy wanted the stinkbag to help his friend.” Do you need to know more. I’m onboard for the rest (unless it’s a kiddy show that runs for a year; I might not have stamina enough for that). Slime is good fun. Not sure I’d expect much originality beyond getting reborn as a slime. Three episodes in, it looks like Sim City with monsters, but I’m onboard. Slime voice acting is fun to listen to. The entire show is just so playful. I like the ending where the slime first sludges then creeps then bounces through the episode’s scenerey. Also, your post just tipped the balance and I’ll go back and check out Gridman. Everyone likes it, and I like the pretty pictures. Stuff you’re not watching? I do suggest checking out Iroduku; stylistically it seems to go down the Glasslip route the most, I think, but without stuff like the chicken nonsense. A little rocky, and they take their philosophy a little to seriously, but it doesn’t seem to hurt this show as much as, say, Nagi no Asukara. I really like it. 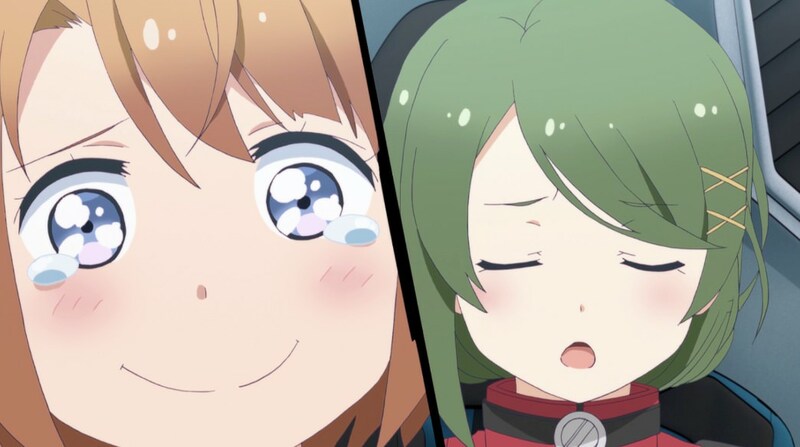 I sometimes wish PA Works would treat their dramas with the light touch that made Umamusume work, but then there’s The Eccentric Family, which is magic. I expect this show to come in my personal PA Works hitlist near the top of the mid-tier or near the bottom of the top list. Bloom into You is pretty good at questioning the special feelings romance is supposed to give you. I don’t expect the holdout to end up actually being aromantic, but what they have is good enough. Sadly for you it’s Hidive, and it’s not really a must-see. Tonari no Kyuketski san is cute. You learn that vampires can’t enter buildings unless invited because they’d be consumed with guilt if others thought they were rude. Beyond that, it’s not too special. Or that vampires don’t like bloody horror films: you shouldn’t waste food. The 4-koma roots are easily visible, but the show flows well. And the colours are Studio Gokumi standard, which I tend to love (if nothing else). All in all, expendable though, if you’re already watching Anima Yell. I’m still waiting for Tsurune. I always wanted to see an archery anime, because I like the aesthetic, and that’s the one thing KyoAni will definitely not mess up. I do hope it’s more Euphonium than Free!!. I’m liking this season better than the last two, so far.